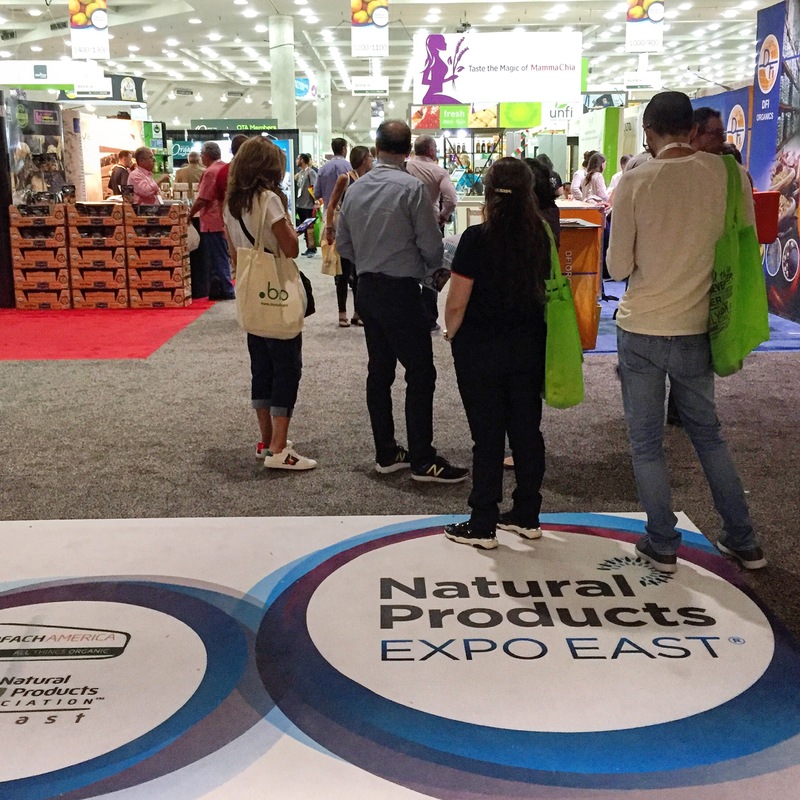 Last week, I attended the Natural Products Expo East for the first time. I was able to attend for just over two hours — so, For those who have never been, I experienced probably .05% of what the Expo truly had to offer. Nevertheless, I had an absolute blast and I already can’t wait for next year! The Natural Products Expo (the “Expo”) is held twice a year. In the West, it’s held in the springtime in California. In the East, it’s early fall in Baltimore, Maryland. I’m fortunate to have this experience in my backyard. I’m also fortunate for the opportunity to attend as press. As a result, I’m able to share with all my readers about the Expo. My attending was a very last minute decision. As such, I had to fit it into my existing schedule, working around my day job. I had limited time to step away from work, but I found an hour and coupled it with my lunch break to make the most of it. The night before, I planned out the booths I would visit. There is no way I could have visited every booth even if I had all three days to browse, so I had to be efficient with my two hours. Unfortunately, this meant that I was, for the most part, visiting companies with which I was already familiar; that didn’t stop me from uncovering a few gems. I arrived, checked in at the press room, and rushed over to the hot foods pavilion. First stop: Field Road Grain Meats. They have a VERY exciting product launching soon that is sure to get every vegan excited. 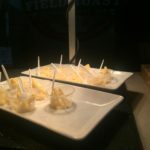 Brace yourselves for Field Roast’s Mac n’ Chao. Yes, you heard that correctly. Field Roast, the makers of some of the most absolutely delicious and juicy grain meats is coming out with a rich and creamy macaroni and cheese using their *perfect* Chao cheese! I sampled the version with their creamy original cheese, but they’ll also be releasing a chili mac version using their tomato and cayenne cheese coupled with some of their grain meats. Around the corner I found myself tasting chocolate from a company I’d never even heard of before. Eating Evolved was sampling their chocolate. I tried the dark chocolate caramel cups which were delicious! And their cashew milk chocolate. From what I understand, they’re they only company producing cashew milk chocolate. It was quite yummy. I was pleased to learn they’re sold locally (in Baltimore) at MOM’s Organic Market. Not too far away I found some more sweets from a favorite of mine: Living Raw. I was pleasantly surprised to learn of a new flavor they’re releasing. The Almond Avalanche Truffle tasted like the top of an ice cream cone — you remember the ones from ice cream trucks: the King Cones or the Drumsticks! Walking around, I sampled a few different kombucha companies. First, Aqua ViTea. I sampled their Blood Orange and also the Elderberry kombucha. They’re currently carried in only two Maryand markets. A few booths down I found a different kind of beverage: switchel. While I’d not heard of switchel before, I can imagine it will soon be a new favorite drink of mine! Switchel is “an original American classic” beverage created from ginger, vinegar, and maple syrup. Cide Road was sampling their three flavors. I tried their blueberry and ginger (though, not the cherry). I loved the blueberry so much I’ve already bought it once since, thanks to it being available at MOM’s Organic Market. My next stop: Kite Hill, with their yummy cream cheese that I’ve never tried before (what a fool I’ve been!) and also their yogurt. The chive cream cheese was absolutely fantastic! Oh my! The yogurt was yummy, too; and a great source of protein. Kite Hill cheese products are available exclusively at Whole Foods, while Kite Hill’s other products are available at other markets as well. The Whole Foods exclusivity agreement, fortunately, is ending soon and the cheese will be more available! Across from Kite Hill was The Jackfruit Company. I’d had their products before, but not the Teriyaki flavor, which actually might be a favorite; it’s something I know my omnivore husband (who even hates fruit) would really enjoy. I’ve bought a package since and plan to make it for dinner one night this weekend. I made my way into a new room, and found a bunch of new products. First, Jackson’s Honest chips! I sampled all of their chip flavors (except the tortillas), and my favorites were the rippled red heirloom and the purple heirloom. Then, more snack food. I sampled Awesome Organic Snacks‘ This Chip is Awesome product line, in the salty sweet kettle flavor, which was addicting! 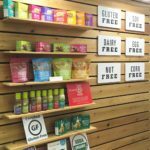 While two of the four flavors have milk, the salty sweet kettle and the olive oil and salt are vegan, and the company advertises itself as gluten-free, non-GMO verified, 100% whole grain, peanut/Trent free, 0 trans fats, kosher, etc. There were some other yummy snacks to taste. First, some Jica Chips. The chili lime and smoked BBQ were great! Most of their chips are vegan, but the white cheddar does include milk. Jica Chips advertises itself as non-GMO, gluten-free, paleo-friendly, non-MSG, nut free, trains fat free, and free from artificial colors, flavors, or preservatives. I also grabbed some samples from Beanitos. The flavor is nice, though the jury is still out on the texture (it crunches nice but it has a grainy quality to it). Lastly in the snacks section I sampled KiiNOA Snacks. The Toasted Cinnamon is the only vegan flavor of their three flavor so. It’s yummy and would make for a great cereal in dairy-free milk! I soon found myself in this dairy free milk zone; everywhere I turned: dairy free milk! First, it was milk from New Barn. I’ve had their almond milk before. It tastes very rich, and with a homemade quality unlike any other store bought brand. I sampled their Almond Creme for the first time, though, and it was quite nice! What I liked most was the shaved coffee beans in the coffee flavor I sampled. Directly across from New Barn was Ripple Foods, a dairy free milk product made of peas, of all things! The chocolate flavor was good but had an interesting texture. (This perception might have been influenced by the fact that a woman came up right as I was throwing back my little chocolate pea milk shot, exclaiming, “I’ve bought your products at Target before, they taste great but when I opened the bottle it was slimy!”) I then tried the plain — I think sweetened…or was it unsweetened? It’s hard to remember at this point, but I do know I was so excited by how flavor-LESS it was. Yes, you read that right, I was excited that the flavor wasn’t potent because I suspect this would make for a great baking milk if you don’t want to disrupt the flavors of your recipe. 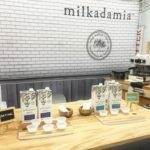 The last (but certainly not least) booth completing the dairy free milk trifecta was Milkadamia. Made with macadamia nuts, this milk tasted absolutely delicious. Absolutely. And also, they had gorgeous packaging design. I wandered the aisles, weaving back and forth, stopping whenever I heard or saw “vegan.” I stumbled upon Emmy’s Organics and tried their new peanut butter macaroon — combining it with their raspberry to create the most perfect peanut butter and jelly flavor! I had also tried Revive Kombucha. 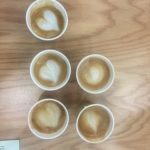 Their rep was very friendly and, upon noticing me carrying a latte from Milkadamia, he was quick to tell me about their coffee kombucha, Up Beat. I also sampled their hibiscus brew. I thoroughly enjoyed both. Revive is non-GMO, Fair Trade, and certified Organic. Like Aqua ViTea, however, it looks like it might be some time before Revive is readily available in the Baltimore area. I had probably used about an hour of my time, and the looming need to return to work started to make me anxious; I was realizing that I’d only made it to fewer than half of the booths I planned to visit. As I sped-walked to the lower level, my sight was captured by yet another company with cool packaging. Avoke served their product in what looked like half of an avocado. Their spoonable, pre-made smoothie bowls came in four flavors. My favorite was the Greens and Ginger bowl. At this point, I was a woman on a mission. I had about 30 minutes left and I knew I had at least 12 more booths I wanted to visit (alas, *spoiler* I didn’t make it to all of them). I barely stopped for chit chat and niceties. Coconut Bliss. New Chocolate Chip Cookie ice cream flavor. Gluten Free, dairy free, absolutely delicious. Next. Silk and So Delicious (sister companies! Who knew!?). Two different yogurts. Bam. Delicious. Next. Sophie’s Vegan Seafood. I’ve really enjoyed their “shrimp.” On a whim, I thought I’d attempt to eat their Vegan Toona, once more following a gross experience in the past. Ick. Still hate it. Moving on. I spent the remainder of my time at the Expo going at a pretty fast pace. But it was still such a great experience. I popped a visit to Dandies Marshmallows. Thank goodness for Dandies. S’mores would not be the same without them. Nor would pumpkin spice lattes, or holiday hot cocoa. I could not find the pumpkin flavor last fall so I’m glad to have sampled it here. It was great. I stumbled upon Tofurky’s booth and sampled their BBQ chicken pizza which, of course, was delicious (I was a bit bummed that just two days later and the DC VegFest I learned Tofurky was coming out with a new chorizo product, but I heard nothing of it at the Expo…womp womp….). Near Tofurky, there was Hilary’s Eat Well. Apparently, it’s been a while since I’ve purchased anything from Hilary’s because I was completely unaware they’d changed their packaging. I sampled their Kimchi patty with their Spicy Island dressing. I also sampled each of their new breakfast sausages — one sweet, one spicy. 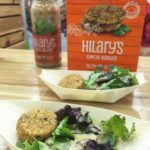 Hilary’s is one of those companies whose products always make me feel healthy when I eat their food! A few booth’s down I found Follow Your Heart, and a few down from that, Miyoko’s Kitchen. 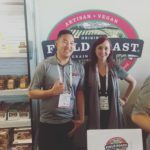 Follow Your Heart was featuring their new sliced cheese line, and I also tried their Miso dressing for the first time — fabulous. At Miyoko’s, no new products were being introduced, but I did sample their mozzarella for the first time on a panini and oh, my, foodgasm!! On my walk back toward the front, I stopped by Lightlife’s booth and grabbed samples of their two new jerkys: teriyaki and original. And I found another new love of mine: Buchi Kombucha. I sampled two of their flavors with pineapple: Seed and Air. Both were really delicious. And I absolutely loved their booth set up! Not only was I cutting it close, with about 5 minutes left of time, but my phone was now on 3% battery. In addition to needing my phone for photos, I had a conference call that I was going to make on my ride back. So the pressure was on. I checked the Expo app to see where I was headed next: Upton’s, then a gluten-free bakery called Sweet Megan Bakery. I arrived at Upton’s and sampled their BBQ Jackfruit — scrumptious. On to Sweet Megan Bakery. They’re advertised as being “top 8 allergen free” and being #MadeWithLove. I tried a chocolate chip cookie, sugar cookie dough, and a pizza crust. I didn’t have time to ask if their products were available locally. I was about to head out when I realized there were a few more booths I wanted to visit. I wanted to test NoBull Burger. The company produces some vegetarian burgers and two vegan burgers: a Sun-dried Tomato and Spinach and the Mama Mia Spicy Italian. Both vegan options are also gluten free. Now, I am a spicy girl — no seriously, I love spicy food. But I actually preferred the tomato and spinach. NoBull is a non-GMO company that uses organic ingredients in their burgers, handcrafted in small batches. My last stop — and I’ll admit, I had actually left at this point and went back in because I had heard two people talk about this product — was at Paul’s Quinoa. Shelf-stable quinoa. I grabbed a package and left. The two hours were overwhelming! Next year, I’ll take off work, I’ll bring a notebook with me to keep track of product information, and I’ll be sure to visit all the vegan companies! Can’t wait to tell you about new vegan products!